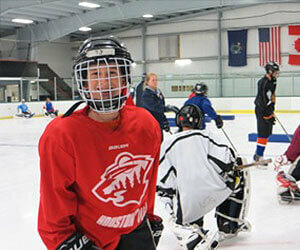 Campers who select hockey as their major at Bridgton Sports Camp are on the ice for at least 13 hours each week. A hockey period consists of a combination of skills, drills, and game play. 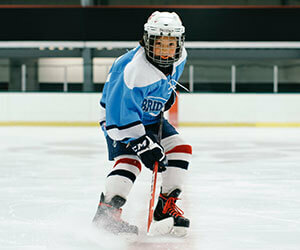 The difference between us and other camps that offer ice hockey is that we have a rink on-site. This provides campers more ice time, which allows us to offer more in-depth, comprehensive instruction on all facets of the game. All campers have their own locker so all of the equipment stays at the rink. In addition to the hockey periods every day, we also have off ice speed/agility training and hockey inter-camp vs. local camps. The overall goal for the summer is to make sure each camper is getting the most they can out of their experience. We have worked with hockey players at every level. It is our goal that each camper will have an experience that not only will be fun but also help them develop into the player they hope to someday be. 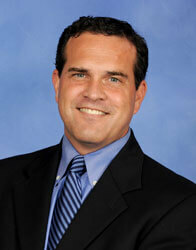 Mike is currently the Director of Hockey and Head Coach at Bridgton Academy. A native of Rockport, Mass., Mike is a 1993 graduate of Iona College where he played forward and served as a co-captain his senior year when he received the “Pride, Hustle and Desire” award. His Collegiate coaching career got underway at his alma mater before accepting an assistant coaching position at West Point in New York for the Black Knights in 1999. After 4 years, Mike accepted a position as top assistant coach and head recruiter for the University of Alabama in Huntsville. Following a 7 year stint at Alabama, Mike returned as an assistant coach at the U.S. Military Academy for 2 seasons before taking the head-coaching job at BA. Move and replace, money in the middle etc.